That is cool. I want to slot those stories in as Do whenever side quests if the party ever needs a break from the main story and to get some extra gear and xp since I am running a 6 person party. What about the Adventure card game stuff like Pillbug that I mentioned? Note: The fugitive adhesive holding the map to the back of the book appears to be quite robust. Use care when removing the map from the book or fugitive adhesive from the map so as not to tear the map. Best method I’ve found is to lay the back cover of the book flat and then patiently “spin” the map repeatedly until it twists off (it can take a little while). If there’s any residual sticky bits on either surface, bundle up the blob of glue and roll it over them to clean it up (scratching with a nail can leave marks or creases). Reviewed. This is the best town/city gazetteer I've ever bought. Too late for me. After 5 solid minutes of gently loosening the molecularly bonded material from the back cover, my map is torn and wrinkled! I am livid. Why not glue along the plain brown border edge instead of right in the middle of Father Tobyn's mausoleum? Ugh. Well, when we finally get something that we've been waiting for, of course people are going to buy it up. Unfortunately, we won't ever get a proper adventure or sourcebook for the Starstone which is a real shame for fans of this edition. Loving the book. But noticed what I think is an error on page 6. It lists Shalelu Andosana as a half-elf. Isn’t she full elf? She's a full elf, as indicated in her stat block on page 77. The half-elf bit on page 6 is a typo. The other half is elf too. Fantastic addition to our campaign, we just crossed over to Pathfinder after 20 years of 3.5 and are running Rise of the Runelords Anniversary campaign this was perfect timing! I bought the digital copy from Paizo while waiting for the hard copy to come from Amazon unfortunately I'm on my 3rd hard copy because the first two had to be sent back because the Sandpoint map is glued to the back cover and tears the map when removing! I'm planning on leaving the map attached to the book and printing the map from the digital copy now. 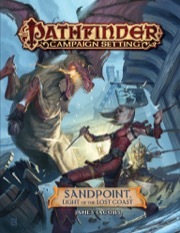 Paizo hopefully your printer will sleeve the map or tuck it between the pages when reprinting! 5 star on content and presentation, 2 star on printing!!! Anybody notice that it's difficult to find this in your FLGS? I'm in suburban Philly and this has yet to appear. When I checked CSI it also has not arrived nor did Runeplague. @imflynt, for the poster map, try the method Steve Geddes gave a couple post back. Works perfectly and I'm prety sure that if I had not seen it before I would have teared the map removing it. And thanks Steve for the tip. Thanks for the Heads up @DanyRay, I tried that on the second copy I bought and it still tore, 3rd copy I used a hair dryer on the back cover and it worked perfectly! Using a hair dryer on hot about 4 inches away from back cover for about 2 minutes and the map fell loose. The another minute or so heating the glue on the map and rolling it into a ball with my thumb and off the edge it went, map & cover undamaged! Your right about availability, I have not found this in any game store and had to order online. Hats of to James Jacobs, this is one of the best city supplements I've owned since Greyhawk! Considering the issue with the glue, has Paizo considered printing and selling just the map? That way, those who don't want to risk damage to their book/map can leave the one in the book. Another quick question. In the Valdemar Manor portion (section 47, page 59) something referred to as "leather babies" is mentioned as an enemy. Is there an enemy stat block anywhere? They're pretty much just Advanced homunculi. James, I would just like to say what a fantastic book this is. I am inspired to run a campaign using the hooks in this book. It will be a very local campaign, just cleaning up the place and pursuing some of the rumours. Finally arrived at The Compleat Strategist in KoP yesterday. The hair dryer trick worked really well to get the map out. Agree with everybody: this is how to do a town/city supplement! I have just bought the PDF and love it! Just one question for the moment: the map on p. 71 has some yellow and red dots - is this some particular mapping convention, or have I missed something in the text? Yellow is an exit outside and red is a secret door. I asked about it in JJ's thread. Are the outdoor exits also technically secret doors? Any particular DCs to find them? ... It seems to me that Sandpoint is littered with secret doors, what with the tunnel system's door, Kaye's doors, and probably others which I haven't found yet (pun not originally intended) in the book. Is there are reason why Sabyl Sorn has become Jabyl Sorn (multiple references, so it doesn't seem like a typo)? changed from LN to LE? Should this be considered a ret-con to apply even to Rise of the Runelords, or does it reflect the after-effects of his experiences? By the way, I love having the street addresses of the shops and such. It is a nice touch I noticed in the updated Curse of the Crimson Throne as well. It makes naming the streets and roads more meaningful, as well. Found my answer with a little more reading. Me too. This is such a good book. I changed her name because when I first made up her name, I hadn't realized how kinda awkward and gross it was for me to name a Mwangi woman "Sabyl." That's an example of a flavor error in text that crept in during the writing of Sandpoint nearly ten years ago that might not seem like an error, but is one I've come to feel was unfortunate and awkward and, yeah, gross. So I changed her name to something more nonsensical that isn't just a "fantasy spelling for sable." (The problem, to be specific, is that sable is a dark brown/black color, and naming a Mwangi woman that is icky to me.) So yeah, it's an official correction and I hope that my error here helps others in the future to be a bit more careful and considerate about naming characters words that have real-world meanings... even if you "fantasy" it up by adding a "y" in place of an "i". His alignment changing from lawful neutral to lawful evil isn't a ret-con. Time has passed in Sandpoint, and many of the NPCs who live there have changed. Some for the better (I'm particularly proud of the character growth for Shayliss Vinder), but some for the worse. Titus going evil is an example of that—and also gives the town a villain in a position of political power for PCs to fight against. He's still lawful neutral in Rise of the Runelords, but the evil acts he's been doing up to that point have put him at the tipping point of going into evil... and by the time the timeline hits where Sandpoint's text is at, he's full on evil. Glad you like the street addresses! I've always enjoyed adding street names to city maps I do, even if they CAN sometimes clutter things up, and it makes more sense from a verisimilitude angle for a GM to say, "Grocer's Hall is at 20 Festival Street" rather than say "Grocer's Hall is area 29." First, thanks very much for the answers. Honestly, I always assumed she was Vudrani because of the Irori worship and being a monk. In the past, someone mentioned they were glad to see ethnicity added to the snippet stats (alignment, gender, race/ethnicity, class, and level) because ethnic tension can be a major part of the Chelaxian/Varisian or Chelaxian/Shoanti situation in Varisia. That's something I wish there had been time and space to include here. It is something I can make an educated guess at from the languages the NPC speaks, but not always accurate. Some can be "reverse-engineered" from other information (Belor Hemlock and Garridan Viskalai, for example), but those are only a few. Finally got this in at the FGLS, and wow, am I loving the adventure hooks being listed by level in one place for ease-of-GM, and yet how they are organically spread through the book and it's not just chock full of notes to see all the crunchy stuff in the GM section. (Which, I know, is convenient for *other* people, but I aren't they, so yay for my own selfish preference winning out!) It's a common gamer-snob diss to call something for a tabletop RPG evocative of how things are done in MMOs, but I totally mean it as a compliment that this 'quest' format reminds me of one of the best MMO innovations. This is the best format I've seen for a book like this. GM-friendly and 'usable,' but also an engaging read. Great work, James! Hello all! This is now available for purchase from Fantasy Grounds or on Steam. Sync your account first to get it a discount equivalent to the PDF Price ($18.99). Love the book! I've been using it to fill out my Rise of the Runelords campaign. We just had our first session last week! With the basement, I get that the left side of the map is the secret lab and that the tunnels are from the mites and go to the pit but what's the deal with the little narrow secret room on the right side of the map? ...just a wide spot in the tunnel that you can put a monster in. When I used Valdemar Manor in my home game, they encountered the missing kid here as a ghoul, which is a bit too dark for print in the book but wasn't for my game, so I left that part out and had the kid hiding in the attic instead. Cool :) My players are going to clear out the manor this Sunday. I'll post up how it goes! I decided to add a Erinat Gremlin in the basement posing as the the ghost of the kid. I thought that'd fit well with the rest of the theme of the crawl. Unrelated, what's Kendra's brother Aiver's town role? Her brother doesn't have a role in town other than citizen. What he is, is a great chance for your PC to be a nephew or neice of the mayor. He's also a good choice for villains to kidnap.